Rise of the Robots: Doing it Gangham Style! Wellington City Libraries are embracing the following trends: technology, coding and robots. To support the Science, Technology, Engineering, Arts and Math (STEAM) learning platform, we now have two new team members to assist library staff in this process in the form of Nao Robot twins: Blue and Red. 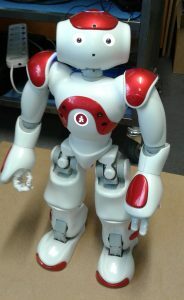 Blue and Red are fully automated Nao, (pronounced ‘now’) humanoid Robots. They are 58cm tall, autonomous, and fully programmable. They walk, talk, listen to you, and even recognise your face. Blue and Red can even whip out a few dance moves to Thriller by Michael Jackson, Gangnam style by PSY and more! Like most humans, if the robots fall down they manage to get themselves back up again, along with a few grunts and groans, and touch wood without any broken limbs or bones. The robots made their official debut at Wellington Central Library on Monday 10th of July, at the ‘Meet the Robots’ event, part of the Beyond the Page literary festival for children during the school holidays. Apart from a few technical difficulties and performance anxiety issues, for both the librarians’ and robots the event proved to be a success. Blue and Red were the main attractions and stole the show. Parents and kids were whipping out their cell phones to photograph and film the robots paparazzi style! Everyone was mightily impressed with what the robots could do. They loved the performances and there were a lot of ‘ooohs’, ‘aaahs’ and giggling, and a huge round of applause at the end! Overall Blue and Red are a welcome addition to the library, as well as an ideal learning platform for teaching STEAM subjects. With the robots on our team, Wellington City Libraries can continue to work alongside organisations, such as schools, businesses and Information Technology Institutes. Together we’ll ensure the STEAM platform is promoted and taught to the wider community – Gangnam style!